India Short Term - 1 month away! Tickets are purchased. Four handouts completed. Two more almost finished. Another two require significant work. The three Indian towns are getting ready for the seminar. 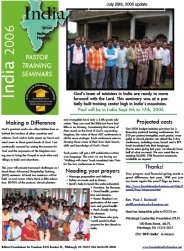 Pastor Stephen said that probably 500 would just show up in the state of Orissa if there was room. But there are no facilities large enough to hold that many. Pray that every thing would work out well for the speakers and the attendees. Paul is trying to finish up the handouts while getting ready for daughter Christy's wedding. It's very busy around the Bucknell house. Attached is a letter that gives more information on the Indian trip along with a financial update. About half of the budget is in so far. $4,000 is still needed. We will get at least one more prayer letter out before Paul leaves.